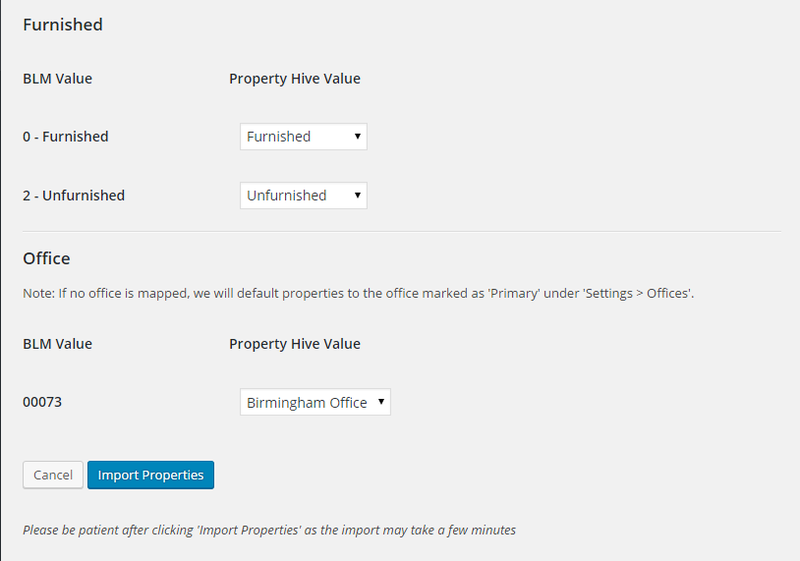 Automatically import properties from your chosen third party estate agency software. 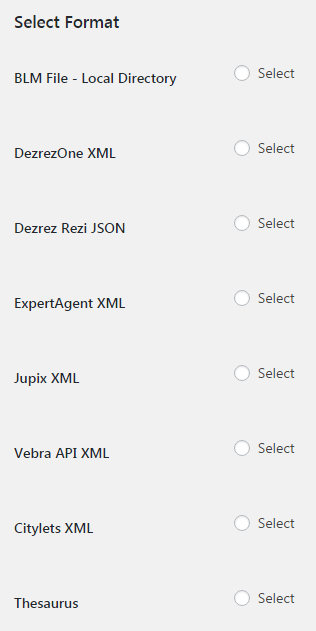 The formats currently supported are BLM, CSV, ExpertAgent XML, Jupix XML, Vebra API XML, Dezrez One XML, Dezrez Rezi JSON, Thesaurus Technology, Citylets XML, Rentman XML, Agency Pilot, REAXML, Reapit, JET and 10ninety. Using this add on you can automatically import properties from all of the major property software third parties using their dedicated APIs and datafeeds. From Jupix to Expert Agent, from Vebra to DezRez, and more, we’ve made it easy to import properties from as many sources as possible. We currently support 21 different formats but are adding new ones regularly. We also support importing data in the BLM format, as well as CSV; Formats that will highly likely be possible to obtain should you not be using one of the software companies listed. If you want to import properties from software that we don’t support yet, please get in touch as we’re always willing to expand the list of supported property software. Using the import wizard you can upload and import properties quickly and easily. The first steps is to choose if you want to perform a manual, one-off upload, or if the import should run automatically at regular interval. If manual, the next step involves uploading the file and getting it validated to ensure it can be imported successfully. If opting for the automatic route, simply choose the format of the file, enter a few simple settings regarding where the file to import can be found, and you’re away. The file imported will contain it’s own values for things such as availability and property type. After validating the file you’ll have the opportunity to specify how these relate to the custom fields you already have setup in Property Hive. Once the import has successfully completed, you’ll be presented with a detailed log containing a list of what went on during the import, including any warnings and errors that occurred along the way. Logs are kept for 7 days and are automatically cleaned up so you can go back at any time to see exactly what went on during each import. If you need to import your properties in a different format, please get in touch, providing an example of the file, and we’ll see if we can get it added as a supported format. – Depending on the number of properties being imported an import can take a while. If you encounter server errors or the import seeming to stop mid-import, we recommend you increase the PHP server setting max_execution_time to overcome this. – Imports are fired by WordPress as a scheduled event / cron job. As a result, please ensure that your WordPress site executes cron jobs. If not you can try alternative cron or a cron job on the server. Your hosting company should be able to assist with this. – Please ensure you’re not using an image optimisation plugin such as Insamnity which might modify the original image. We sometimes compare filesizes to check if an image has been updated or not so need the original as it was when it was first imported to prevent the image being imported again and again. – If using the BLM format and a ZIP file is provided, you’ll need the PHP ZipArchive class enabled in order to extract the ZIP’s. This class is enabled by default on most servers. 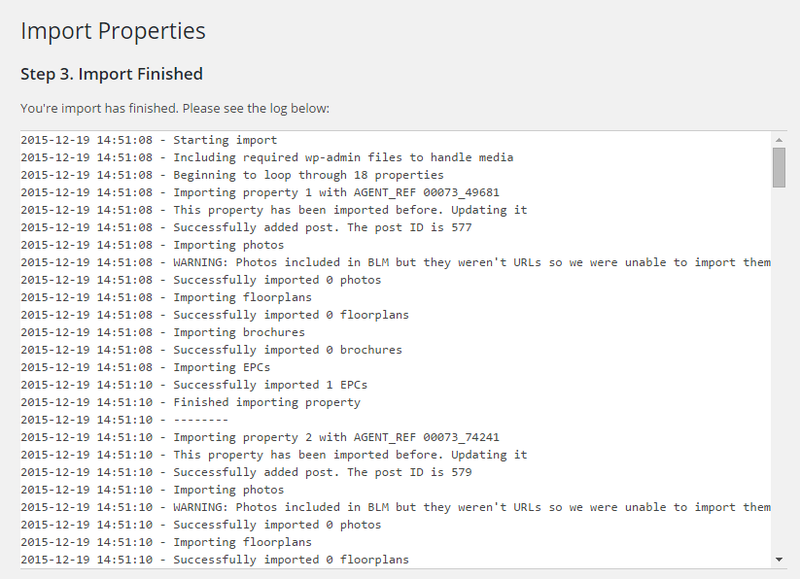 – When performing a manual, one-off BLM import, any media (images, floorplans etc) must currently be provided as full URLs. If choosing to automatically import BLM files, media can be URL’s or sent as physical files. – If you encounter issues importing the feeds or media when they’ve been provided as URL’s, it’s likely due to the settings on your server. Please ensure either allow_url_fopen or cURL are enabled on the server. – If using the Vebra or Dezrez Rezi format, you’ll need cURL enabled. * Added office and negotiator mapping to Agency Pilot REST API format. Office mapping can be controlled when setting up the import and entering the ID of the office from Agency Pilot. When mapping the negotiator Property Hive will look for a WP user with the same name, otherwise will default to the current user. * Added additional warning when deleting import that has on market properties. Was causing support when people created a copy of an existing import and wondered why the old properties weren't removed from the market. 's and line breaks which resulted in double spacing on front end. * Updated JET format after restrictions added their end which caused imports to fail. The change is to not get all properties in one go now but obtain them in batches and paginate through them. * New format, 10ninety, added to list of supported formats. This is an XML which they provide a URL to. * Do addslashes() when storing media URLs from ExpertAgent format. For some reason some media URLs contain backslashes which would be removed by WP. * In ExpertAgent format cater for when department names have been customised. Previously we would check for 'Residential Sales' for example but turns out these can be customised by the client to be just 'Sales'. * Prevent manual execution of import when there has been any activity in the past 5 minutes. This indicates an import might already be running and therefore could result in duplicates and other issues. * Check that finfo class exists before trying to validate file type. * Only remove properties if one or more properties we processed in DezRez and Vebra formats. Stops all properties being removed if issue with API request. * Fixed issue with each import not being considered independently when working out if it's ok run. * ExpertAgent import to cross check both country names and country codes when trying to set the property country.